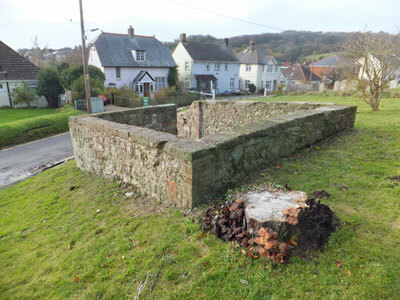 Brading village Pound, behind the church on Quay Lane. In medieval times, the Hayward, or 'hedge warden', was the officer of Brading parish who had the management of the pound and received a small sum from the party concerned whenever he released an animal from the pound. For a long period the Pound was neglected and became overgrown - in November 2016, a group of students from the National Citizenship Service spent two days clearing the inside and surrounding area of the Pound.